Lake Erie Tree has been a local provider of quality mulch since 2009. We process all our brush into finely ground mulch chips perfect for your home decoration, flower bed, or landscaping needs. We have purchased a colorizer and are now pleased to offer our mulch in brown, black, red, and natural colors. We store our mulch on Route 2, just west of the North Curtice Road intersection. Only minutes away from Toledo, Oregon, Northwood, and surrounding areas. You can see our mulch pile as soon as you pull in the driveway. Call to schedule a time and we will load your truck, wagon, or trailer for you. We sell this mulch by the yard, and can quote a price over the phone. We also offer professional brush grinding services. This is the perfect solution to comunity brush piles that keep growing. We bring our grinder to you and turn that yard waste into usable mulch for the community. 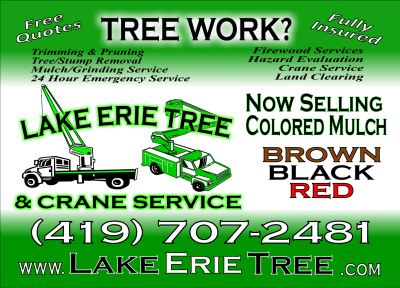 Lake Erie Tree is fully insured and meets the requirements for municipal work in Ohio. We provide quotes based on the size of the project, so give us a call to arrange a time to meet and we'll handle the rest. 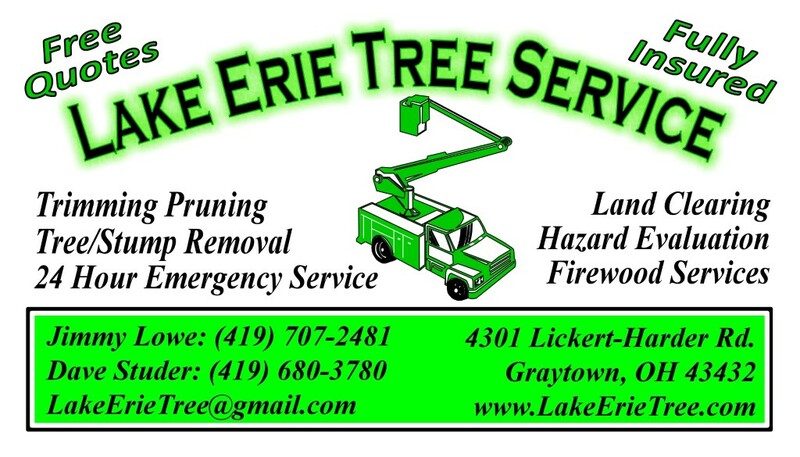 Lake Erie Tree Service started as a small venture in 2009. Since then we have added bigger and better equipment to provide the best service to our customers. Give us a call about your project today.